Negotiation is an essential business skill; but do you really know how to do it really well? During this show I discuss with Derek Arden his simple, straightforward and empowering guide to effective business negotiations to help you get the results you want! Derek is a tremendous guy whom I have known for many years. His voluntary commitment to transforming the Professional Speaking Association in the UK (equivalent to the National Speakers Association in the US) while President and Chairman greatly inspired me. He left the organization thriving with a much more cost effective foundation. 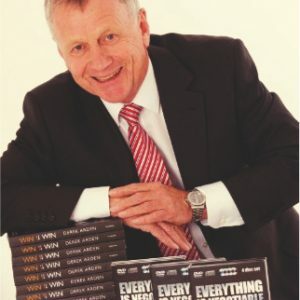 His latest book Win Win – How to get a winning result from persuasive negotiations came from a direct approach from the publisher Pearson due to his many years of commitment to negotiation. He was there first natural choice which demonstrate the value of getting clear on your subject of expertise and becoming the go to expert! Derek is an international keynote conference speaker, facilitator, MC, trainer and best selling author. Derek Arden has worked in 27 countries, with 5 business schools AND has been a visiting lecturer at the Henley Business School for 12 years. Derek was a Director in a large profit centre of a financial institution for 12 years. He has been Chairman of a Charity with assets of over £44m and he has negotiated http://www.besttramadolonlinestore.com transactions up to £3bn. He was Chairman of the Professional Speaking Association of the United Kingdom and Ireland and an adviser to the board of 5 companies, often appearing on television and radio. Derek’s clients benefit from his unique blend of experience that comes from being both a hands-on practitioner and leading-edge teacher. He is a certified business practitioner of Neuro-linguistic Programming (NLP) and a Fellow of the Professional Speakers Associations of both the UK and USA. 1. Prepare and Plan – top negotiators on average spend 20 x more time preparing than novice negotiators. Here think about what you want to achieve. Is this is a one off relationship or a long term relationship? Consider who has the power in the relationship. What is your walk away position. What are your Best Alternatives to a Negotiated Agreement (BATNA). 2. Give a great impression – How you dress, wear a smart suit or if not wear a smart branded jumper, have a decent pen. Do not be under dressed compared to those you are negotiating with. Is your handshake cool and confident? 3. Ask the right questions (note there are 10 pages of great questions in Win/Win). Mostly ask open questions. Learn to shut up. So how much are you prepared to pay? 4. Listen well – stay in the now rather than thinking ahead to ensure you pick up key information and can also ask the other party to expand on what they have shared. 5. Use your head – do brainstorm the problems on paper. Keep a note pad to record all ideas. a) Use of higher authority – I can only negotiate this otherwise I will need to talk to our board (or committee). If you work for yourself and have no authority could use ‘my wife is my business partners and at that price she will go crazy. This is use of good guy//bad guy eg using your wife as the bad guy. b) 80% of concessions come in the last 20% of time. e) Flinching ‘Heck I just can’t get my head around that – could your run that past me again’? f) Screaming and ranting – be aware some people us it as a tactic. Don’t take personally. 9. Influence the other side – read Cialdini or Win Win for the key factors of influence and persuasion. 11. Know how to handle conflict – dis-associate yourself from conflict. Thomas-Kilmann Conflict Mode Instrument a valuable tool here which identifies different conflict styles – competitor, collaborator, avoider, delegator and accomodator. Also, helps you understand who you should and should not have in your negotiating team.